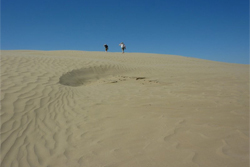 Access to viewing area of active dunes, first grid road E of Sceptre off Hwy 32, then S to Great Sand Hills. Watch for signs. ​This spectacular tour loops throughout the Leader area and includes The Great Sandhills Museum, the Great Sandhills, River Ridge Golf Course, Estuary Hutterite Colony, Blumenfeld Church and more. Tour begins at 8:00 a.m. and leaves from the Leader Tourist Information Centre. Snacks and drinks are included.